Albert Camus, in The Myth of Sisyphus, set out absurdity as the search for meaning in a universe that was essentially and vitally meaningless. It is in continuing the contemplation of death at the borders of comprehensible thought, that the real effort is expended: to give up life but remain living. Or rather to forfeit and consign ourselves to the knowledge of our own limits, the futility of searching beyond those limits, and choosing to live anyway. But this living does not have to be simple survival. In embracing the nothingness, the absurd; in being conscious, Camus tells us, of the void of meaning that we grapple with in our lives in many forms, we can create our own meaning and flourish in hopefulness – or let it be our demise. If a Tree Falls takes these existentialist themes and distills them, applying the lens of the classic epistemological conundrum – ‘If a tree falls in a forest and no-one is around to hear it, does is still make a sound?’ – to the generation of value in art and the interplay of the artist’s intention, the gallery’s control and the viewer’s interpretation in shaping it. The principle narrative is positioned in the three sections of Discombobulation, a 4.4 by 2 metre vinyl banner. It has been speculated that the term ‘discombobulation’ originated from colloquial play on the words ‘discomfit’ and ‘discompose’. Discombobulation, the work, embodies this process of genesis, where its components are starting points from which we extrapolate and create meaning. The fact that discombobulation the word, was the result of colloquial word play and not derived from orthodox origins reiterates the absurdity in the way humans make sense of their world. That a joke word rising from the 19th century can so aptly mean what it sounds like, where other synonymous terms ingrained and enshrined in history can often fail to capture the same essence veritably exemplifies what the phrases in Discombobulation are saying. Contemporary art, as a time and place, has been arrived at through millennia of ‘significant’ people and work. It is often nestled securely in white walls. In reaction, Ford looks to undermine the pretense and decorum surrounding the way value is incubated in the gallery space and protected by all those who ‘get it’. He is evoking the ‘awkward’ realisation that, in If a Tree Falls, everybody’s impressions about the work are equally valid. “Wait, what?” Discombobulation holds a mirror to the awkwardness of art with indisputable definitions of significance and meaning. The writing is in cursive to give an accessible and hospitable impression to counteract the puzzlement and confusion that comes from the way that established norms govern how work is interpreted as well as asking whether it is the work, the gallery, the artist or the viewer who is speaking the phrases. Furthermore, these phrases, ‘Wait, what?’, ‘I don’t get it.’, ‘This is awkward’, actually depict the work’s own reading. These are the feelings that pass through us as we try to make sense of the show that, when all familiar signals and points of reference are taken away, is in an almost alienating state of flux. Potential Drawings continues simultaneously questioning how meaning can be extrapolated while demonstrating the precarity of its being. The works are playful, yet beneath this folly we are taken to the conceptual brink of death. Death, the ultimate question and uncertainty. If it is not death that we contemplate, certainly, it could be the fear of persecution for failure to see a prescribed image that we are confronted by. From whatever perceived incongruity that may arise, Ford’s work inverts that negative position and prompts us to be able to ascend again with the foundation of potential that he lays down. The emphasis, as how Camus posits we live our lives, is on the viewer to activate the drawings – or not – on their own terms, not in some predefined way. In this sense Potential Drawings can also be seen as a continuation too of a critique on white-walled galleries that coddle contemporary art, playing the function that the church does for religion; effectively, narrowing the margin of interpretation and protecting the ideas and relics from external criticism. Perhaps the most poignant feature, more than the notion that any interpretation is valid, is that the act of interpretation, even if no image can be gleaned, is itself meaningful and valuable. The artist is, in many ways, replicating what the viewer is being asked to do, and is embracing the relinquishment of his own control of the works’ interpretation. The Holey Ghost completes the show and deals with the notion of false idols and ideals, which again ties back to the interplay of the gallery and the viewer in generating value. The ghost is a tangible representation of the illusion of meaning. While its existence is actual and verifiable, the holes allow the viewer to see beneath at the falsity and fragility of the object-assemblage, made from a fashion mannequin, paper mache, a swimming pool noodle and gardening gloves stuffed with cotton wool. 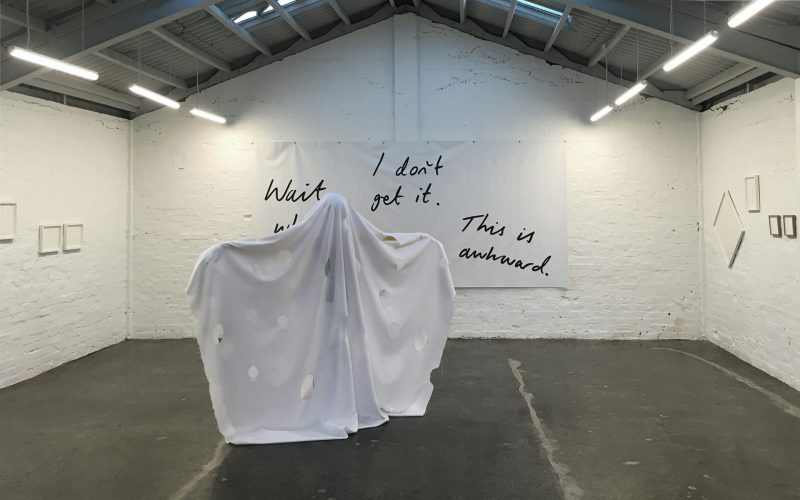 Ironically, the work is what it is: a holey ghost, which brings the viewer to ask and attempt to answer the main query of the show. Who has the authority to prescribe definitions for art and for life? Whose interpretation matters? Is value generated by the artist, the gallery or the viewer? We may even have set notions about these queries, but what If a Tree Falls is attempting to do, is open up the conversation. You will notice too, that while the ghost appears to be raising its arms in a frightening posture, the body inside the sheet is in fact in the position of crucifixion. Full of contradictions, The Holey Ghost is alluding to the farcical nature, the fallacies and shortcomings of the Holy Ghost, of religion, that makes it difficult to believe in. This is yet another form in which the work challenges accepted, morphostatic and authoritative notions and representations of what constitutes worth and the power to define it. We are told that art is valuable. But ultimately, what matters is our interpretation, our choice or ability to join the dots, our belief in the ghost, our overriding subjectivity that engenders value – or not.